Phil Lynott statue, Harry Street, Dublin 2. Posted in Misc and tagged Phil Lynott at 1:50 pm on October 8, 2016 by Broadsheet. does your ma know you’re online? You ma didn’t mind me using her computer last night. Its a limp wristed statue anyway. Get rid of it and put a Live and Dangerous version in Crumlin. It’s you again, upside down man. What’s it all about? You’re an employee? Only cowards use two names, I just use the same one thrice. Having said that, I do agree with Votey McVolteface, even if Votey changes their mind. They should knock down Crumlin Shopping Centre and replace it with a massive statue of Phil, inna ‘Live ‘n’ Dangerous; album cover pose. Or “this boy is cracking up”? forfeckssake, you deserve an applause. It’s hard, with only one hand. The man deserves a better statue, this is on a par with the Molly Malone. Irish sculpture must be some of the poorest in Europe. Drive along any motorway and see what’s on offer. Eamonn, as a yung’un, I remember rocking up to see him as a solo performer in Club Caroline, Glenageary – before Thin Lizzy – and the very long walk home. You’re right, the guy definitely deserves a bit more than the little he has had (‘though I’d still prefer to have HIM). Imagine what’s going to be erected for Bonzo, when the time comes! Bleeuuch. At least they’ll only have to melt down a handful of coppers to make the Bono one. Melt the current statue down and replace it. A bit of Polyfillo should fix that. Really? Go on. . .
Is it under guarantee ? Replacement, repair or cash refund……or fit for scrapyard. He deserves a better monument. That’s not general ‘wear ‘n’ tear’. Some scumbag damaged that. Does everything nice have to fenced off? Looks like that what’s gonna happen. Probably just ‘the lads’ having a bit of craic in between a dozen or so pints each, you know, those things happen, lets not spoil the fun. 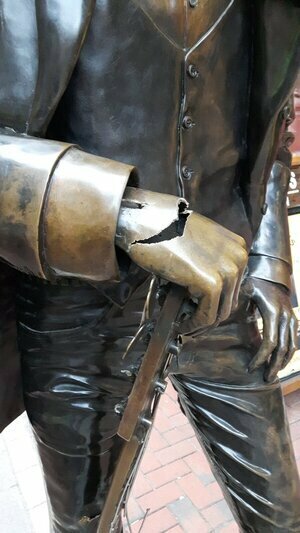 The statue was ‘moved for repairs’ last year. I reckon that’s when the damage was done.